Not only do balance bikes come in all shapes, colours, materials and sizes – so do the seats on the bikes so we thought it would be useful to prepare some information on balance bike seats to help you in your search for the best balance bike. Most balance bikes will have a triangular shaped seat, and the material of the seat and the amount of padding provided will often depend on the cost and overall quality of the bike. Many bikes towards the lower end of the price range will have a hard plastic seat, so although these types of seats are very durable they don’t provide much comfort for the rider. A good example of this is the Chicco Red Bullet Balance Bike, which is one of the best value balance bikes available at around £30. 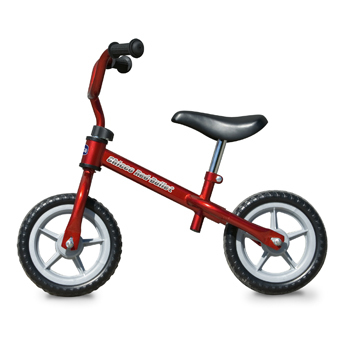 Although it does not have a huge range of features, it is great for younger children just learning to ride and it is one of the smaller balance bikes available. Some of the more expensive bikes towards the higher end of the market will offer various layers of foam padding, which does make the ride more comfortable although will usually increase the cost of the bike. The Specialized Hotwalk Balance bike includes a padded seat, and although it is much more expensive at around £130 it has a high specification and a great range of features. We must not forget wooden balance bikes, which will usually come with a wooden seat! One of the main disadvantages of wooden balance bikes is that the seat does not usually have as large a range of heights as metal bikes, although they are more environmentally friendly and look great as well. You can read our full guide to the best wooden balance bikes elsewhere on this website. Some balance bikes now also offer U-shaped seats, which will help the rider to stay on the bike - especially if they are freewheeling downhill when they might be likely to slide off a plastic seat. The material and shape of the seat is just one aspect to consider when you are buying a balance bike, and perhaps a more important factor is the actual height of the seat and the range of heights available. Check out our Balance Bike Seat Height Guide here!